Biologists discover new worm species on submerged whale carcasses. If your high school biology teacher had a sense of humor, you may have already seen the notorious exploding whale video. 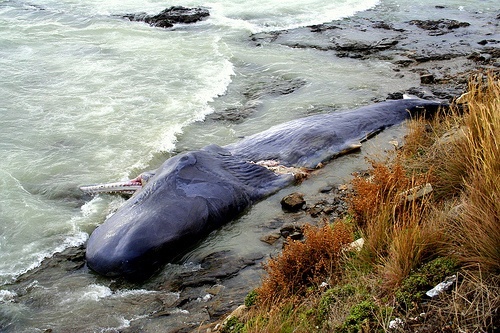 (Note: Oregon State officials have since learned their lesson on effective whale cleanup.) But most whale carcasses don’t rain down in fleshy chunks upon curious beachgoers. Instead, they sink to the ocean floor, where they’re a welcome banquet for countless organisms in an otherwise nutrient-poor environment. The dead whales of the deep, called “whale falls,” actually host entire ecosystems where many new species—like cube-shaped anemones and bone-eating worms—have been discovered in recent years. Now, zoologists at the University of Gothenburg in Sweden have identified nine previously unknown worm species on whale falls in Scandinavia and California. The newly discovered worms are classified as polychaetes—bristly, segmented animals related to earthworms and leeches—and they live off the carpet of bacteria that grows on the whales’ bones after swimming scavengers have stripped the meat. Here’s where it gets really weird: when the researchers ran DNA analysis on the bacteria-chomping worms, they found several so-called “cryptic species”—species that look exactly like each other but have notably different genetics. And it turned out that a worm species on one California whale was more closely related to a Swedish whale-fall worm than to other Californian types. Helena Wiklund, who undertook the whale-fall research for her dissertation, writes that it’s unclear why the species are distributed so strangely, though it’s possible that their larvae stow away on ships’ hulls. It just goes to show that when it comes to understanding how these worms evolve—and how exactly they spread between the decomposing whales that dot the globe—there are still some depths to plumb.